In Christopher Guest's mesmerizing mockumentary Best In Show, terrier owners Gerry and Cookie Fleck sang the song "God Loves A Terrier" to their party guests before they headed off on the road to Philadelphia for the Mayflower Kennel Club Dog Show. Our man, Tortuga, is a Terrier as well. Above and beyond his love for the Mets, Jets, and mob movies, he is a Boston University hockey nut. And for one glorious and improbable weekend run to cap off a heroic season, he echoed the Flecks' anthem. As a Freshman at Boston University in 1999, I lived in Claflin Hall, a west campus dormitory that overlooked the football field. The catch was, we had no football team. Chancellor John Silber ordered the underachieving team disbanded during Homecoming weekend of the 1997 season. Luckily, the Terriers were known for their talent on the ice, not on the gridiron. By 1997, the Terrier hockey team had 4 National Championships and countless Frozen Four appearances to its credit. Fresh off of a 1995 National Championship, led by future NHLers Chris Drury and Mike Grier, and another trip to the title game in '97, the Terriers were keeping the rest of the college hockey world back on their heels. So there was no reason to assume when I arrived at BU that trips to the promised land wouldn't be a common occurrence over my four years on campus. My Freshman year, I attended my first game on January 9th. I had a standing room ticket for a matchup with BC (or Chestnut Hill Community College as we so affectionately refer to them) The game didn't disappoint: BU came out on top scoring twice in the final 10 minutes of regulation to win 2-1. And I was hooked. 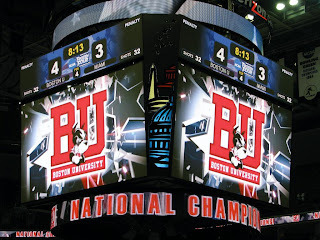 That season, backstopped by Islanders #1 draft pick Rick DiPietro, BU took a 25-9-7 record into a regional final matchup with St. Lawrence, with the winner advancing to the Frozen Four. After 4 overtimes, DiPietro's 77 saves weren't enough. BU fell 3-2. Season over. Fast-forward to the 2008-09 season. I'm 28-years old and have considerably less hair than I did back then. What I also didn't have, after being a season-ticket holder for 9 seasons, was a trip to the Frozen Four. The perennial powerhouse had been to the regional final 4 times in those 9 seasons...Record: 0-4. BU shot out of the gate, seemingly determined to show the college hockey world they still mattered. BU defeated national powerhouses North Dakota, Michigan State and Michigan early in the season. The Terriers also picked up all the in-season hardware they could muster: The Ice Breaker, Denver Cup (knocking off Top-5 opponent Denver), the Beanpot (over 2nd ranked Northeastern) and the Hockey East Regular Season title. They followed that up with a Hockey East Postseason title and headed to the NCAA Tournament, perfect season in tact. But this was the hill BU hadn't climbed since '97. The one to the Frozen Four, and tied 1-1 with rival New Hampshire in the Regional Final, I found myself thinking this is a movie I've seen before. But with 14 seconds left, senior Jason Lawrence flipped the script. The 2-1 win meant we'd be packing our bags for Washington D.C. and the Frozen Four. In the Semis waited another familiar foe, the Vermont Catamounts, who had bested BU 4-3 on back-to-back nights earlier in the season. That night, Vermont scored at the 9:40 mark of the 3rd period to take the lead, by the familiar score of 4-3. Same old story. Same old Terriers. That didn't happen. In fact, the opposite happened. The perfect season seemed all but lost as Miami University scored with 4:08 left in the 3rd period to give the Redhawks a 3-1 lead. This certainly had to be it. The BU net stood vacated, the ultimate act of a desperate coach, with 3:32 left on the clock. The seconds, which always seem to tick faster when you're behind, melted off the clock. All season long, players wore shirts under their uniforms that read "Burn the Boats." On the back, a picture of a pot of gold with the letters DC in the center. Hounded all year about the meaning of the phrase, players and coaches refused to divulge the information until the season was over. In 1519, Hernan Cortez set sail to the Yucatan with 600 men, his sights set on Aztec riches. When his 11 boats landed on the shores, he ordered the very boats that had carried them there to be burned. It was a sign to his men that there would be no turning back and for them to be successful it would require 110% commitment and dedication. The only way they would be able to make it back home would be in the boats of their enemies. The story must have worked...on Saturday night, BU took Miami's boat back to Boston. Two goals in the final minute. Game-winner 11:47 into OT. College Hockey is a niche sport and always will be, but if this year's NCAA Hoops tourney had half the drama the hockey produced this year, they'd be talking about it for the next 100 years. Of the 15 games, 4 went to overtime and 5 had goal scored in the last 20 seconds of regulation to either tie or win the game (2 with less than a second remaining). The Championship Game immediately shoots to the top of best sporting events I've ever attended (right alongside the Men's Wimbledon Final last year and in front of Robin Ventura's Grand-Slam single in the '99 Playoffs). Quite a list that's being compiled...Let's hope the 2010 Championship joins the list next season.